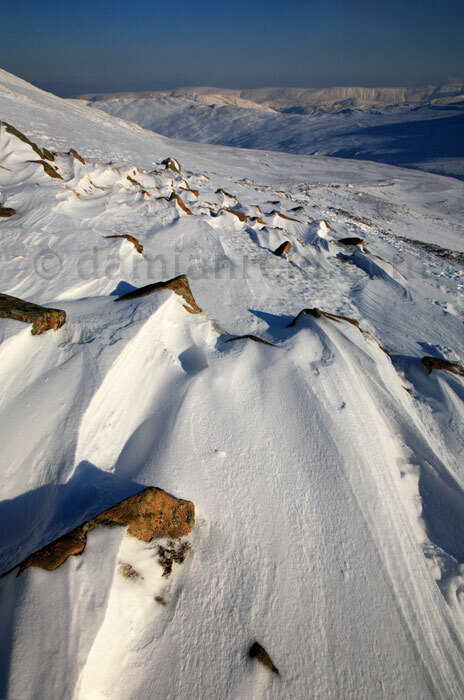 "Wind sculpted snow formations around rocks on the side of Swirral Edge. A warm glow lit the snowy tops as the sun dropped in the late afternoon. This photo was taken looking east across Striding Edge towards the fells forming part of High Street in the distance, among them Wether Hill, Red Crag and High Raise. The summits of the Nab and Beda Fell can be seen just before them."